Archaeologists and researchers from the University of Illinois have spent over a century studying Cahokia, North America’s first native city. For the first time, this wealth of knowledge about Cahokia has been used to create a Story Map entitled, Re-Envisioning Greater Cahokia. Staff from the Illinois State Archaeological Survey (ISAS), a division of the Prairie Research Institute, are responsible for turning the data, maps, text, and rarely seen images into the one-of-a-kind Story Map. One of the catalysts for creating the Story Map was the Ancient Cahokia Future Visions Conference hosted by ISAS this past April. Archaeologists, native peoples, advocates, alumni, and government dignitaries gathered to talk about Cahokia’s past and future preservation. One of the central themes of the conference was to help people understand Greater Cahokia is a world-class heritage site that is seriously in danger of loss due to metropolitan development. To help convey that message, invited speaker and University of Illinois alum Robert Hormell suggested ISAS create a Story Map for conference attendees. 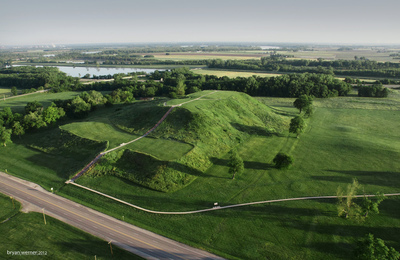 “The ancient native city, Cahokia, has often been referred to as a world treasure ‘hidden in plain sight.’ Although a small portion of this UNESCO World Heritage archaeological site is preserved in a modern park, the vast majority of this city that covered over 5 square miles in AD 1100 is buried beneath the modern infrastructure of cities such as East St. Louis and Collinsville. Thus, the challenge is to promote public awareness of this unique buried history – the Re-Envisioning Greater Cahokia Story Map is a powerful tool helping to reach that goal,” said Dr. Thomas E. Emerson, Illinois State Archaeologist and ISAS Director. “One of the missions of the Illinois State Archaeological Survey is to bring the story of ancient places, such as Cahokia, to the world. ISAS does a great deal of active research on this internationally recognized ancient city and its outlying and endangered villages and religious sites. We want to tell the story to our technologically savvy children and grandchildren, and this story map is an important first step in our larger effort to preserve it for posterity. We hope students and teachers, as well as the public at large, can benefit from having the story map at their fingertips,” said Dr. Timothy R. Pauketat, Professor of Anthropology and Visiting Research Scientist at the University of Illinois.